Last week, I wrote a groundbreaking article, which outlined the basic premise that interest rate levels affect P/E ratios that investors are willing to pay for stocks. I also made the call that even at a P/E of 20, stocks are cheaper relative to bonds, and could withstand doubling or tripling of the interest rates, while still remaining more attractive, relative to bonds. So there is some margin of safety in common stocks today, relative to bonds. The only way that bonds do better than stocks over the next ten or twenty years is if we get deflation, and we experience a situation that is similar to Japan between 1990 - 2016 or US between 1929 - 1933. Just to be on the safe side, when I discuss bonds or fixed income, I want you to know that I mean long-term US Treasuries. The interesting part is that a lot of pundits have been expecting higher interest rates in the US for the past 8 years. Their train of thought has always been that these rising interest rates will potentially reduce the demand and prices for stocks, and dividend stocks in particular. A lot of investors have been deceived by this train of thought. These pundits have been wrong for 8 – 9 years in a row. Interest rates have been declining, and stocks have been rising. Unfortunately, many companies are selling above 20 times earnings these days. The fear of rising interest rates is even more pronounced today, as stocks are selling at lofty valuations. Several of the companies I own are selling north of 25 – 30 times earnings. I am talking about the likes of Brown-Forman (BF.B) as well as McCormick (MKC). This is a little too rich for my taste, because I am finding it increasingly difficult to find where to put new capital to work. I am also unwilling to reinvest dividends back at 25 – 30 times earnings. 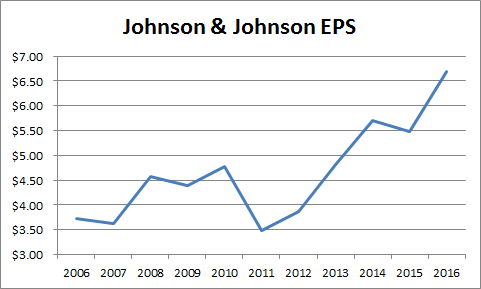 Nor am I willing to reinvest money in companies like Johnson & Johnson (JNJ), which sell at attractive valuations, but represent one of my largest individual stock holdings. While observing my networth rise to all-time-highs feels great, I also get the feeling that a valuation compression back to 15 times earnings could result in drops in net worth. I am a long-term investor however, so I remind myself that large drops are just part of the game, and that I should focus on the dividend income stream, and ignore that manic depressive Mr Market. Perhaps this is why I use a mind trick, where I focus my attention on the rising stream of annual dividend income, rather than the crazy fluctuations in stock prices. 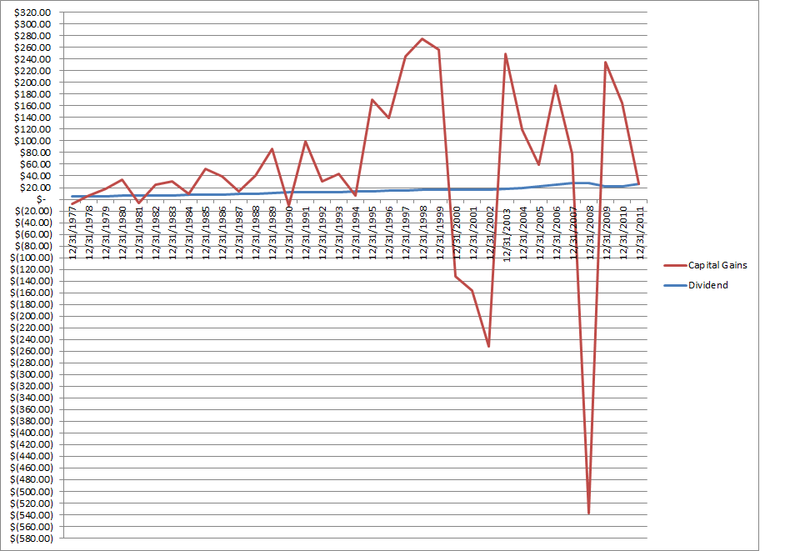 The stable dividend payments are the only sane thing in this otherwise crazy place called "the stock market". If you are afraid from rising interest rates, and resulting stock price fluctuations, you need to focus on dividend growth stocks that can grow earnings per share over time. A business that grows earnings per share will eventually bail out the shareholder, even if the P/E multiple is compressed from say 25 to 15 times earnings. For example, let's look at a business that earns $1/share and sells for $30/share and has a P/E of 30. If it pays a dividend of 30 cents/share, the stock yields 1%. If the business manages to double earnings per share every decade, it will earn $2/share in ten years. The dividend could then easily double to 60 cents/share. Even if the valuation is compressed to 15 times earnings, the long-term investor would still have a business that is worth roughly $30/share. The business would be yielding 2%, but also offer the potential for even higher dividend income and capital gains over time. Of course, if the growth continues at the same rate over time, the business will likely double again in value after a decade.Therefore, the long-term shareholder would have been better off after holding on for 20 years in total. And as a side note, this is why long-term investing is so difficult – you can have extended periods of time such as the first decade in the investment we discuss here, where your investments may seem like they are “not working”. If you purchased a stock for $30, and it sells for $30 in a decade, it is little consolation that earnings and dividends have doubled, and the stock is actually valued attractively. The weak hands will start to get discouraged from the lack of progress and start selling, capitulating at the bottom. These people will either leave the stock market, or follow another strategy that has produced recent record of returns. Of course, once that strategy has a temporary hiccup, this person will bail out, never really accumulating much money in the process. Only the patient long-term holder, who holds through thick and thin will ultimately prevail in this game. It is difficult to see your investments dropping in price every day, and then going nowhere for a decade. But unfortunately, this is the price you pay in order to be able to generate the high returns that stocks provide over time. This strategy of course will work if you expect more prosperity over time, which should lift earnings, dividends and share prices. For certain companies that do not grow earnings over time, the shareholder will be under a double whammy of shrinking valuation multiples and static or shrinking earnings. 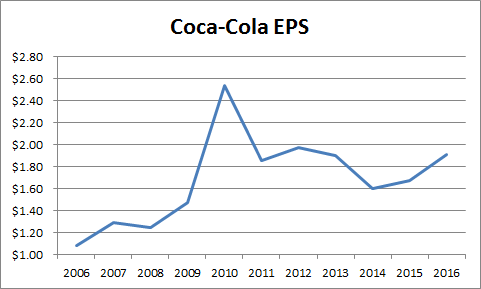 For example, Coca-Cola (KO), which is one of the dividend kings, is selling at 23 times forward earnings of $1.91/share and yields 3.20% today. However, the company has been unable to earn more than $2/share since 2011/2012. If earnings are static, we won’t be able to see much in terms of dividend growth over time. This would be a problem if interest rates increase, because you will be stuck with a static dividend stream which will be worth less. While I am not the one that likes to sell stocks, I am observing those where earnings have not grown for several years in a row. I would not be interested in purchasing Coca-Cola stock today. 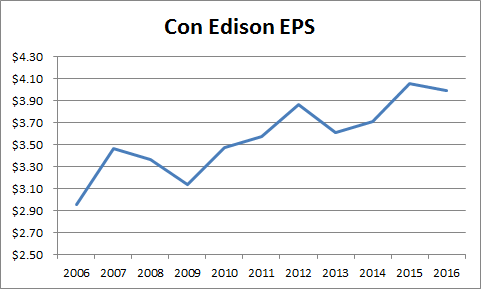 Another company I would be hesitant to buy today is that of Con Edison (ED) at 19.20 times forward earnings and a dividend yield of 3.50%. This utility has been unable to grow earnings per share over the past 8 years, which explains the low dividend growth rate of around 1% - 2%/year. At the same time, the company dilutes existing shareholders by issuing shares all the time. While revenues have been static over the past decade, the number of shares outstanding has increased from 250 million in 2006 to 296 million today. If interest rates double from here, the earnings may be depressed, and the value of those future dividend streams may be viewed in a more negative way by shareholders. A four percent yield is great, but only when it can grow at or above the rate of inflation over time. On the other hand of the spectrum, we have Johnson & Johnson (JNJ), which is selling for 17.90 times forward earnings and yields 2.70% today. The company has been growing earnings per share, and is likely to keep growing them over time. Therefore, this is the type of investment which will likely do well even if interest rates double from here. As you can see, growing earnings per share will ultimately bail out the shareholder, because they lead to higher dividends and increased stock prices over time. 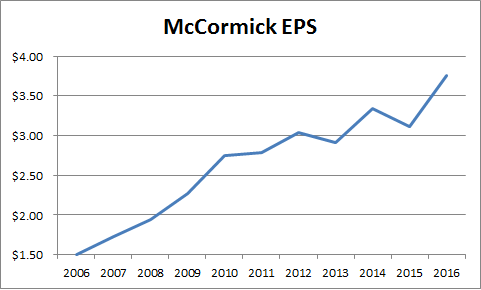 We also have a company like McCormick (MKC), which has managed to grow earnings over time. Despite the high valuation north of 27 times forward earnings and an yield of 1.70%, I am willing to sit this one out, because future earnings growth will ultimate “bail me out”, even if the valuation multiple compressed to 15 times earnings. Those higher earnings will result in higher dividend payments for owners 10- 20 years down the road. Chances are that all of this could lead to higher share prices as well.